Divorce and eye-watering legal fees need not go hand in hand. There is another way. We are living in changing times. Where the old and accepted ways of doing things are no longer working for us. We need a new approach. And this is very true of ‘the way things are’ when it comes to money and ending a marriage or civil partnership. It can be all too easy to become preoccupied with the minute details and miss the obvious fact that your finances are being sapped by ever-spiralling legal fees and legal spending. Stop Paying Out! is designed to empower you by giving you the knowledge you need to escape the well-trodden path to bank account depletion, by showing you strategies to keep your spending in check during your divorce or civil partnership dissolution. Packed with useful tips and step-by-step case studies, Stop Paying Out! will show you the ultimate process for saving money, practical ways to reduce what you spend and precisely how to slash your legal fees. You will learn how to get legal advice without paying for it, how to put money back into your pocket and where to find other free sources of legal advice. 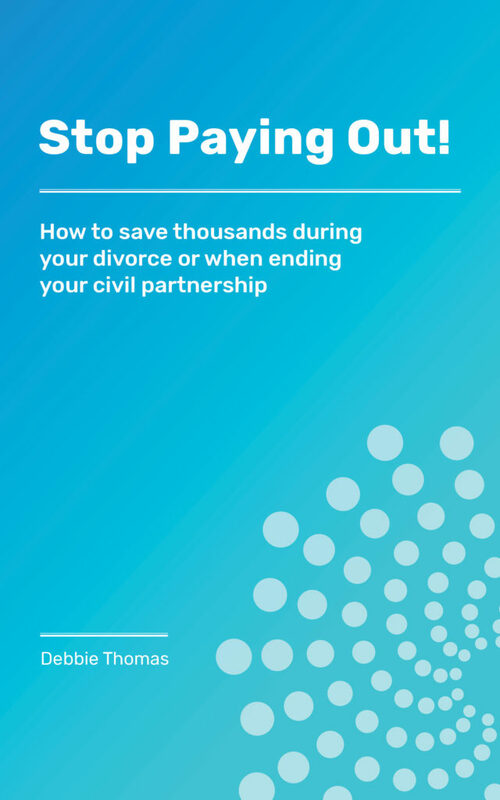 It really is possible to radically reduce what you pay for when ending your marriage or civil partnership – whether you use a lawyer or decide to go it alone and handle all or some of your case yourself. Order your copy of my book, Stop Paying Out! today. It will save you £1000s.